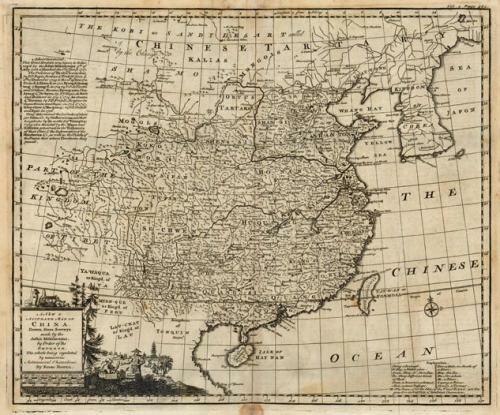 A finely engraved map of China and Korea with detail primarily in China. The map was derived from the Jesuit survey of 1708 to 1717. A table at left details these surveys and a key at bottom right provides the meaning of relevant Chinese words. Embellished with pictorial title cartouche and small compass rose. Condition Description: A dark impression with light toning and offsetting. There are a few spots of foxing confined to the blank margins. Ref: Shirley (BL Atlases) G.HARR-1a #28.